Republished, with permission, from Voice magazine, Mar/Apr 2013. On another occasion, in what could have been a major church crisis, Ray and Goff taught me to respond with compassion and understanding to the negative reactions we sometimes face. Ray, one of the church trustees, taught in our Christian Day School. Goff, the church treasurer, was a retired Los Angeles County fireman. 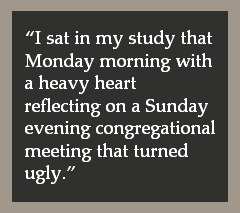 I sat in my study that Monday morning with a heavy heart reflecting on a Sunday evening congregational meeting that turned ugly. No violence, no overt threats, just ugly. Midway through a building expansion, we discovered that an additional piece of property was available. Most folks saw it as a great opportunity to complete the block of property already owned by the church. Others thought adding that final corner to our property was a merely cosmetic, large, unnecessary expense. The discussion got heated, voices raised. Charges of waste, deceit, and trying to control the church through private negotiations were all aired in the tense exchange. In the end, calm prevailed and the congregation voted by a large majority to complete the purchase. As I reviewed these events and contemplated the impact they might have on our building project, Goff, who was among those opposing the purchase, entered my study. Sitting down, he took a deep breath, and got directly to the point. He went on to tell me that he had just written himself a sizable check from the church building fund to pay off a loan he had made to the church for the expansion project. We both knew that the effect of this was to put a stop-work order on the project. Words like obstinacy, dishonesty, theft, and fraud leapt to my mind. I wondered how this man who was a strong supporter of our Christian Day School could so callously stop progress on the facilities the school desperately needed. Remembering my first lesson in pastoral people skills, I held my tongue as he rambled on about how terrible the previous night’s decision had been. Late in the evening of that same day I related these events to a hastily called meeting of church Elders and Trustees. Ray broke the stunned silence when he said, “I know Goff well. He is an honest man, and I think there must be something more behind this. May I have your permission to go and talk to him and see how we might solve this?” We readily agreed, and after a time of prayer went our separate ways. Goff had not cashed the check. The loan he had made to the church, Ray learned, was from his retirement fund. With health issues looming, Goff feared he might not have enough to meet his own needs. The church set up an accelerated payment schedule, and Goff voided the check. This was soon followed by adoption of new financial policies to ensure that such an incident would not recur. Goff resigned as treasurer, but remained a faithful participant in the church and volunteered hundreds of man hours working on the project he almost derailed. It was Ray’s willingness to take the time to understand Goff’s concern that deterred this faithful man from completing an action that he would have regretted. Ray’s quiet response also kept the church leaders from taking quick, decisive action that may have threatened the progress of the church. Arnold Wall, another faithful IFCA pastor and NICE Board member, taught me one of the most simple and most effective people skills that I use often. “Pause,” he told me. He went on to explain that a pause before answering a question says the question was important. A pause before responding to an accusation indicates humility of spirit. A pause gives you time to weigh your words carefully. Sometimes a pause is needed just to think of a meaningful response. I am still learning. I do not always speak wisely and carefully. Even wise, careful words and actions do not guarantee that the results will always be as positive as the incidents I have related. My list of such encounters, both positive and negative, could be lengthy. But I have learned that people skills are the practical application of godly character clothed with humility, faith, and patience. That should occupy my attention until the day God calls me home. Many more men fail in ministry for lack of people skills than for lack of theological training. Earl Brubaker is a vetern church planting missionary in the NW United States. He was General Director of the Northwest Independent Church Extension, located in Tacoma, WA and now serves as president of the IFCA Board of Directors.